We couldn’t have picked a better place to visit during the January cold snap. RHS Wisley gave us the perfect balance of frozen landscapes and a thawing walk around this year’s butterfly event in its iconic Glasshouse. Seeing the tropical butterflies at RHS Wisley is one of my recommended ways to beat the winter blues in the UK, so it was a must-see during our stay at Bel & The Dragon Inn in Surrey. 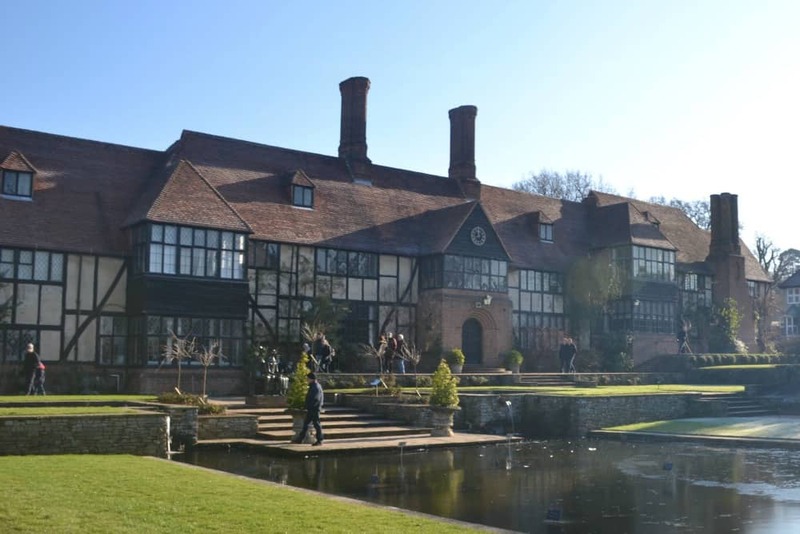 Wisley was handed into the care of the Royal Horticultural Society in 1903 after being used as an experimental garden for growing difficult planets for several decades. Trails and education remain important aspects of what happens at RHS Wisley today. At the beginning of each year RHS Wisley’s Glasshouse comes alive with more than 6,000 exotic butterflies. In 2017 there are 50 species from areas of the world such as Central and South America and Southeast Asia. The Glasshouse’s Tropical Zone where they fly is designed to mimic the conditions of a rainforest. We arrived an hour after the gardens opened and headed straight to the Glasshouse, admiring the frozen landscapes as we walked to the far end of the 60 acre grounds. While the flower beds and borders have only a fraction of the foliage you would see in the spring and summer, there are still enchanting works of art to entertain you as you walk through the gardens. The special sculpture trail has been created by artist Alison Catchlove whose work centres around nature. RHS Wisley is obviously extremely popular with families at the weekends as the buggy park outside the Glasshouse was already brimming with pushchairs when we got there. In the first half of the Glasshouse we saw two glass fronted cases where butterfly chrysalises were incubating. Tin Box Tot didn’t believe us when we explained that these hard looking pods would turn into beautiful butterflies. That was until we spotted a very young insect that had just emerged from its cocoon, drying its new wings. We walked on round the Glasshouse, admiring more art hanging from the roof. Then it was time to enter the Tropical Zone. We hadn’t felt the need to remove many layers until now but as soon as we walked through the plastic drapes, designed to keep the butterflies in, we hit a wall of heat. Off came all our winter coats and I wished we’d left some of our outer layers with our pushchair. Between us Mr Tin Box and I got rather warm just carrying our discarded clothes. The Tropical Zone was the most crowded part of RHS Wisley with people shuffling around the Glasshouse’s walkways and vying for the best spots to photograph the butterflies. You can buy a Spotter Guide for £1 when you enter the Glasshouse to help you tick off the butterflies you see. We notched up a Glasswing and Giant Owl before becoming too absorbed in watching the insects fluttering all around us. Fifteen of the species have never been seen at RHS Wilsey before including Blue Waves, Giant Swallowtails and Tiger Leafing. The pretty and practical base layers worn by the Tin Box girls were sent to us by Three Bags Full – a New Zealand company specialising in 100% pure New Zealand merino sheep wool children’s and baby clothes. These helped keep them toasty warm under their coats in the frosty gardens and were cool enough to wear while we spotted butterflies in the steamy Glasshouse. They have become a firm favourite with the girls and I love knowing they are comfortable during our indoor and outdoor adventures. Back outside we quickly pulled on our coats and began our walk back towards the entrance. It was like wandering through a winter wonderland. This was the coldest weekend I can remember in a long time. Tin Box Tot marvelled at the frosty lawns and enjoyed skidding around on frozen puddles. Even the ducks looked at bit bemused. The gardens are home to one of the largest collections of plants in the world. While we weren’t able to fully appreciate them during our winter visit, there was so much open space for the girls to run around. It would be great to return in the warmer months to explore the different planted areas of Wisley in all their colourful and perfumed glory. During February Half Term (11-19 February, 2017) there will be a range of family events at RHS Wisley. Events are included in the standard entrance fee. Check the website for details and save 10% on entry by booking tickets online. RHS Wisley’s butterfly event continues until 5 March. Disclosure: we were invited to visit the butterflies at RHS Wisley in exchange for a review. All views are my own and those of my family. We were also sent the girls’ Three Bags Full outfits in exchange for a mention on the blog. I’d love to go to RHS Wisley. We go to RHS Harlow Carr all the time and love it so it’d be fab to go to Wisley too. The photos of the gardens on frosty winter day are stunning. It had me mesmerised. I can’t remember the last time I saw so much frost and ice well into the day. Wesley is lovely and I’d definitely like to go back in the spring or summer if we are in the area. wow, I’d love to visit RHS Wisley. I’m a fond of butterflies and I love to see many of them too. Yes, it is stunning right?! Imagine the views from those top windows across the landscape. Amazing! It definitely would. I’d really like to go back in another season to appreciate more of the gardens. This is so beautiful. I love butterfly houses. I live in Sheffield and one of my favourite days out is the tropical butterfly house. 🙂 my son loves it and I like the exotic feeling! Looks like a lovely day out, really nice photos. It will be wonderful in summer. The butterflies won’t be there but I know the gardens will be amazing! Pretty cool that you can get a taste of the tropical climate in the middle of winter and enjoy viewing all of the butterflies. Isn’t it awesome to introduce your littles to the concept of metamorphosis? It is kind of mind-blowing, isn’t it! That’s fab! I can recommend it. My two love maps. I always grab one when I see them during our days out as I know they will be entertained for ages with them. I love exploring gardens in the fall and winter. It gives such a different perspective! 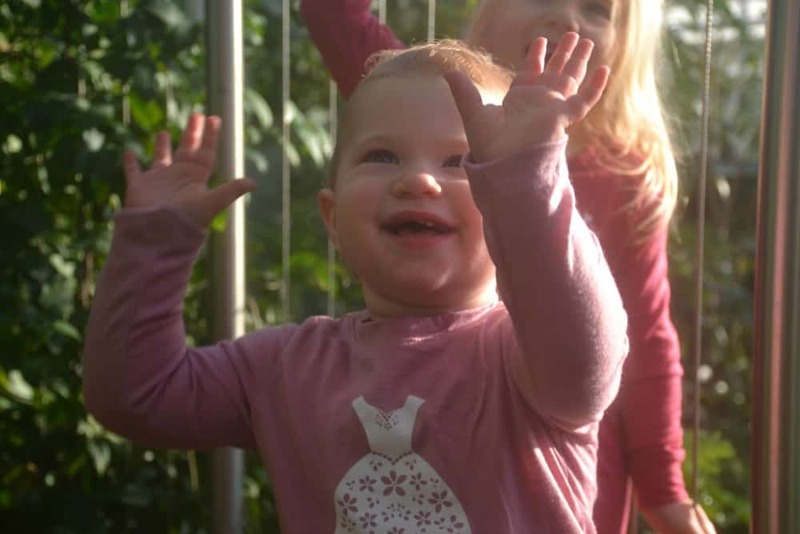 You planned such a lovely outing at RHS Wisley – I would love to explore it with my family. It was a lovely morning and you are right. It is great to see this type of place in the winter. They are so bright and vibrant. I loved seeing the flashes of blue and red all around us. I was really surprised by how many butterflies we saw. This absolutely takes the cake for butterfly gardens and public space! We love exploring parks and gardens when we travel, and this whole complex is amazing. Very reminiscent of Golden Gate Park in San Francisco. Ooh, I haven’t been to San Francisco. I’ll have to make a note to visit the park when we do go. How charming! Grounds look pretty too. They really are. I’d love to see them in summer now. It was a lovely place to visit and we saw it at such an extraordinary time with the ice and frost. What a great way to escape the winter cold, stepping inside a tropical glasshouse. It was so toasty warm after the icy cold outside! We love butterfly farms we’ve visited a couple on recent holidays, there is something about that is so calming and just makes you smile when surrounded by butterflies. Oh I’ve wanted to go here for ages and I didn’t even realise there were butterflies there! Hope you don’t mind but ok pinning your post for future reference! Thanks so much for hosting #MondayEscapes! You’re very welcome to pin it 🙂 The butterflies are only around for a few more weeks, so get there quickly if you’d like to see them this year. I’ve learnt something new today! I didn’t know that’s what Tanama meant. Looks like a great place to avoid the cold for a little bit. Your girls look so thrilled! 🙂 I have a weird fear of butterflies. I was told they would make me blind as child and even though it’s not true, I’m still scared of them! The frozen garden looks stunning though, so I would love to visit that part! I do love how gardens like RHS Wisley are introducing art/sculpture into their gardens – it’s made me visit country estates even more. Your photos are stunning – hot butterfly colours and icy frost too – just beautiful. Thank you. The landscape and weather did all the work! What a wonderful place to visit in the middle of winter… all those beautiful butterflies and tropical plants are great therapy for winter blues. It looks veeeery cold in the gardens, but I imagine just how beautifully it will be transformed in summer. Yes, the extra warmth was very much appreciated. It did play havoc with my camera lens though, steaming it up at the crucial moment when we came to the butterflies! This looks fantastic! We love exploring gardens, so it’s right down our alley. Adding RHS Wisley to our UK “to do” list! Have a wonderful time! We easily filled a morning and there was lots more to see. I was lucky enough to have a tour here when I visited for a work meeting; must go back with the toddler! It was a really good place to go with the kids. Lots of space and interesting things to see. And they loved seeing the ice. We don’t get as much now as when I was their age! Definitely. It was really interesting for me too! So many people are! I didn’t realise until recently. It was a lovely experience though. Oh wow Claire, RHS Wisley sounds lovely. How cool that you were there just in time to see a butterfly emerge from its cocoon! Your girls are growing up so much, they are so different to when I met them at the Bristol event! I know! Every time they blink they grow an inch!